This one's in such beautiful shape I had to take a picture. 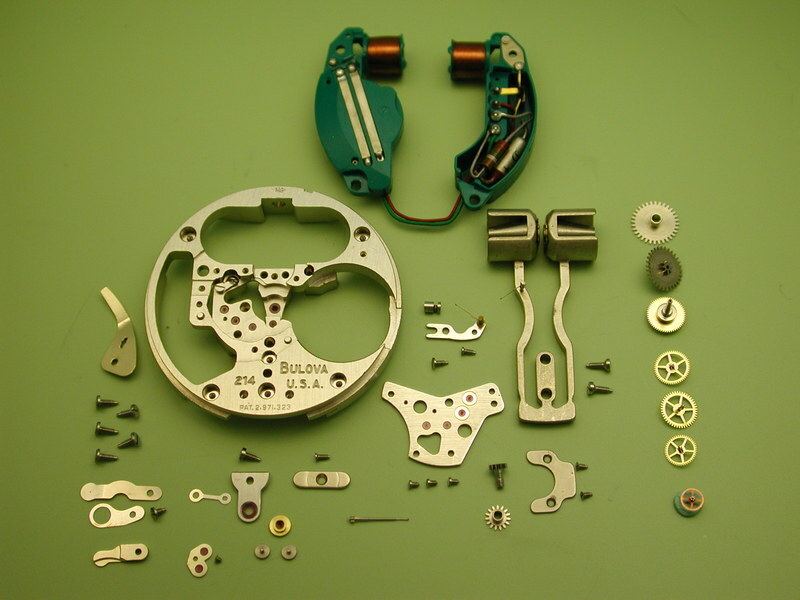 This looks like one of the pictures in Bulova's advertisements showing how simple and how few parts the Accutron has. If you're familiar with mechanical watches, especially the automatics that were popular at the time, it really does look simple. This is all the parts but the power cell, dial, hands, and case. The index wheel at the lower right, which has 300 delicate tiny teeth, must never be allowed to touch anything except the cleaning fluids in the ultrasonic, so its pinion is stuck in a little ball of Rodico (watchmaker's putty) for the picture.